Artichokes are silly. What I really want to know is who was the first brave soul to try to eat one? And did they use melted butter, or ranch dressing, or hollandaise sauce for dipping, or did they just start munching away without bothering to even cook it? I caught a TV show today as I flopped on the couch, exhausted from the gym. It was some famous Italian cookbook author showing what to do with artichokes. I finally got up, got my notebook and a pen and took notes, since I have a forest of artichokes in my back yard – no kidding. Now, I’m a good cook, but I often look for shortcuts that mostly involve the microwave. Not the pressure cooker, because the damn thing scares the bees knees out of me if you get my drift. (I think fear of the pressure cooker was passed down to me from my mother’s very DNA. Her mother apparently had a traumatic experience with one…) My best friend swore by her pressure cooker for artichokes, but it’s so totally against my grain that I found a shorter short cut in the microwave. Normally I trim the stem so it’s flat, I cut the tops off so I don’t poke myself, then I wash them and, still dripping, pop them into a ziplock bag without closing it all the way. Then I put them in the microwave, hit the “fresh vegetables” button, and away they go. The theory went that, after you cooked them that way, the tough hairy choke would just pop out with the slightest pressure from a spoon. I’m sure it would; I’m also sure a lot of the nutrients of the artichoke would get left behind in the water it’s cooked in. But of course she had a suggestion for that as well – use that liquid as a kind of sauce over the artichoke. And that’s where I kind of lost my patience with her. I mean, come on. Artichokes are a delivery system, pure and simple. They deliver either melted butter to your tongue, or freshly made hollandaise sauce (I’ve got an easy-peasy recipe, if anyone wants it). Maybe a ranch dressing. The nub of the artichoke is a bonus bit of tastiness. Artichokes, if you live in a temperate climate, grow like weeds. I planted a couple of plants several years ago. If you knew me, you’d know that often things die in my garden because I forget to water. Hey, it gets hot here in summer, and when it’s over 100, I don’t go outside except to slip into an air-conditioned car. But these babies, once they’re established, don’t need any kind of regular watering. My garden is proof of that; if they did, I wouldn’t have a single artichoke plant out there by now. The biggest of my plants is a globe artichoke, and it’s threatening my Bearss lime tree. It’s also spawned smaller plants. Those smaller plants are quickly growing big. We’ve taken eight artichokes off the plant this year so far and there are still four left. And that’s from one plant – we’ve now got six that produce, which makes my friends very happy. This entry was posted in Cooking, Observations and tagged Amazon, artichokes, butter, Crescent Moon Press, demon soul, fresh vegetables, hollandaise sauce, pressure cooker, silly. Bookmark the permalink. Don’t forget mayonnaise and I do boil mine. Love them!! Me and mayo just don’t get along. Boiling seems to take forever – how long to you boil them from, Bobbye? I’ve always love artichokes — I clean, cut off the sharp points, and then stuff with breadcrumbs, seasoning and parmesan cheese. Top with a drizzle of olive oil. Double boil for about 45 minutes, until you can easily pull a leaf out. I went to a local farmer’s market this weekend, and they were selling those gorgeous purple flowers. I guess that’s what happens when you let them go. I’ll see if I can email it to you. Louisa – the first time we had artichoke plants, we neglected them so badly all three artichokes bloomed. They were GORGEOUS flowers, all purple and pretty. I may actually have to let a couple go to bloom this year. How do you clean the choke out before it’s cooked without a lot of pain and effort? I’d love to know! Fun blog!! I first had artichokes when we spent a month in California and it was artichoke season. We had them almost every night–as a butter delivery system 😉 I just forwarded the link to your blog to my son who lives in NM. He has a huge garden and I suggested he plant some — although he has a very green thumb so they might not grow for him. Judi, you never know – your son may end up with more artichoke plants than he can handle. My oldest plant is about 4 feet wide and 5 feet tall, so if he does plant them tell him to put them on a hill that has full sun and nothing else around it, and space them at least 3 feet apart, lol! I had no idea how easy it was to grow artichokes! You could sell them on a corner here and make a small fortune. They sell for $2.00@ in the local grocers. I’m Italian so I learned from young to stuff artichokes with seasoned breadcrumbs. Made that way, they’re a holiday tradition. I’d love a stuffed artichoke recipe! Any and all recipes welcome! I do it all by eye but will figure it out and get it to you in writing. They take a while to make but are oh so worth it! Do you know if they can grow in a pot or do they need to be in the ground? Here in the city, there’s little space to plant unless you use flower pots but I’d love to grow some of my own. You need a big pot. I mean BIG. At least 24″ opening at the top, and at least 24″ deep. Bigger if you can get it, and put it in the sunniest place you can find. 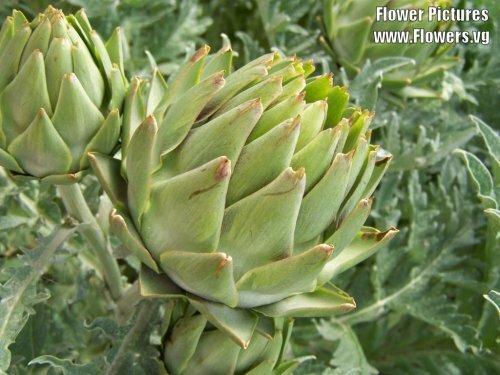 You can probably still find artichoke plants in the nurseries and Home Depot and places like that. Let me know how it goes! And that reminds me – it MIGHT fruit the first year, MAYBE the second year – definitely the third year. I’ve had plants set fruit at all different ages so don’t rip it out the first year if it doesn’t produce. I love artichokes but they are pretty silly. I usually steam them on the stovetop. I often eat them without any dip. Just a little salt and maybe pepper. Artichoke hearts are sooooooo good but I don’t really know how to extract them. Once you’ve pulled all the big leaves off the artichoke and only the tiny ones are left, take a small sharp knife and cut just below the choke line – you can see where the tiny leaves meet the heart. Cut all the way around that line and dig the choke out – now you’re left with the yummy heart to dunk in butter! Or to salt and pepper, lol! Now, I want some!!! 🙂 Hi lady! I like to cook, but I have never attempted an artichoke. In fact, the only way I’ve ever eaten it is on pizza. You know, they put those pickled artichoke hearts on pizza sometimes I’m going to have to do some more research and try cooking an artichoke. Thanks for this post. It was way too long to post as a comment here.